The VL and VH domains have been moved to show the CDR loops. 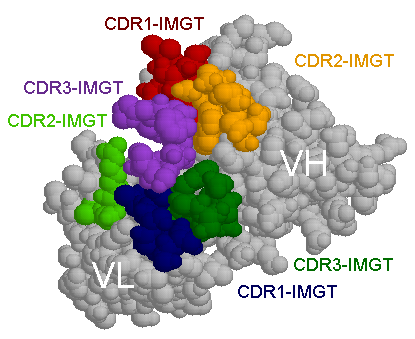 The antigen-binding site is formed by combining the variable domains of light and heavy chains. Residues present in all six hypervariable (or CDR complementarity Determining Region) (three in each domain) may be actively involved in the molecular interaction with the antigen [1,2]. They create a sufficiently large surface area which is essentially flat for protein antigens . Large protruding flexible loops are not encountered frequently at the antigen-binding surface of conventional Antibodies) .